The Evil Within 2 Story Trailer | Nerd Much? Father Theodore "always hides his true face." 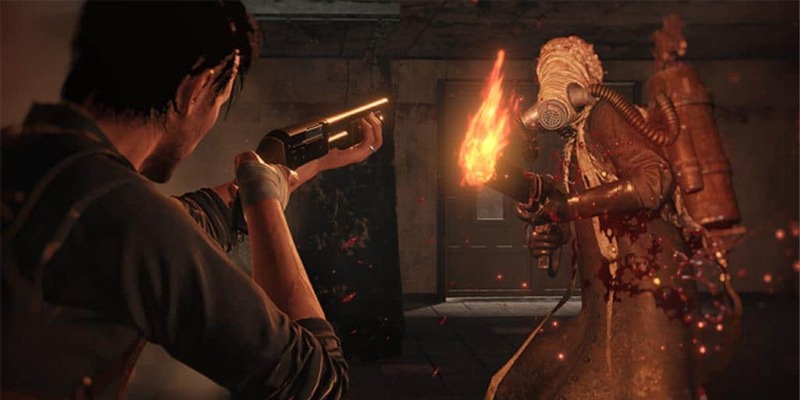 Bethesda has revealed another trailer for The Evil Within 2 focused on another main antagonist, not unlike the photographer Stefano. This villain goes by the name Theodore, that is Father Theodore. He is a self-proclaimed priest who is out to help Sebastian – sort of. Theodore is a master manipulator and promises good ol’ righteous fury is Sebastian doesn’t cooperate and survive long enough to save his daughter, Lily. Theodore’s true motivations lie in spoilers, however, and Bethesda is determined not to reveal anything. Writer Trent Haaga elaborates that Theodore uses “neuro-linguistic programming” to manipulate the people around him, especially Sebastian and his own disciples. It is a way of speaking that real life cult leaders use, in order to make themselves seem nothing but the picture of a guiding hand. Someone trustworthy that will get you through the worst of times – all the while they are very much serving their own purposes. Like Stefano and his ability to stop time, Theodore also has his own version of powers. He can see the truth of a person, “what you’re hiding and what your weaknesses are,” as Johanas states. Theodore of course uses this against Sebastian, in order to trap the poor man and manipulate him further. That said, what I’d like to know is who is controlling STEM? Is it all these individual villains? Where do they come from? From what mind is this a reality? So many questions and still two weeks before the game releases. The Evil Within 2 is out on October 13, 2017 for the PS4, Xbox One, and PC. Check out more of the best new horror games of 2017 here.